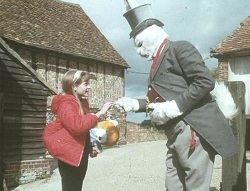 From its beginnings in the early nineteen-fifties to its winding down almost four decades later, The Children's Film Foundation was a well-intentioned attempt to entertain Britain's kids specifically (though the projects were exported to overseas markets), and if there was an educational element, it was more to do with staying safe and other such life skills rather than a trip to a museum for the young characters. Throughout the Foundation's existence, it was admired and enjoyed as much as it was dreaded by some sections of the target audience who wanted to see the movies the grown-ups were watching, but there was nothing else like it in cinema. 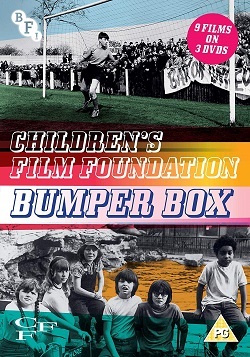 The BFI have released many of these films, often merely an hour long, on DVD, and in their Children's Film Foundation Bumper Box they present nine films on three discs: The Bonfire Night adventure (that doesn't take place at night) Peril for the Guy (1956); football feature with Matt Busby's Manchester United side as a deus ex machina Cup Fever (1965); invisible rabbit memory imprint Mr Horatio Knibbles (1970); pachyderm palaver Anoop and the Elephant (1972); Yeti kidnap thriller The Zoo Robbery (1973); ecology lesson The Battle of Billy's Pond (1976); nuclear disaster was imminent in One Hour to Zero (1976); foiling jewel thieves in 4D Special Agents (1981); and finally Roger Daltrey assisting a Musical Youth-esque band in Pop Pirates (1984). All are worth watching even if you didn't remember them from your own childhood, but Mr Horatio Knibbles was perhaps the most memorable of the bunch. Brits of a certain age would recall seeing this in a Saturday morning picture show along with cartoons and serials, or in the school or church hall, where a responsible adult would dust off the projector and run a few reels; some even escaped to television, the CFF's main rival, where in the eighties a cash-strapped BBC showed a collection as the Friday Film Special over the course of a few years before the weekend, often to much consternation from the children watching - they often looked out of date, even three or four years after their official release. Horatio was a six-foot tall imitation of the James Stewart comedy favourite Harvey, only in that film we never saw the rabbit, and here they had gone to the trouble of making a proper rabbit costume - take that, Hollywood! The little girl who was our heroine wanted a pet bunny for her birthday, but gets this invisible entity instead, polite to a fault but also hungry to a fault and given to putting the wind up anyone who cannot see him. Although there were possibly apocryphal accounts of the younglings getting the fright of their lives from Horatio, I can attest from first hand experience that he went down like free ice cream at the school screening I was at (or maybe we were just happy to get out of classes). What made Knibbles survive the passing of the years better than other CFF efforts was most likely its sense of humour, which was genuinely laugh out loud in places. Lines like our protagonist telling her little pal that to see the rabbit she must swear, garnering the response, "Like Daddy does?" 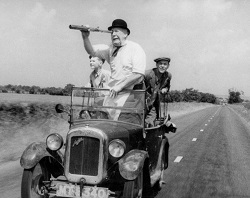 are guaranteed to amuse, as was the more traditional and obvious slapstick and broad playing from the indulgent adults, including among them Freddie Jones, Bernard Horsfall and David Lodge, thought the lesser known Fred Evans threatened to steal the show as the comedy copper. Also intriguing was young star Lesley Roach's resemblance to the Enfield Poltergeist case's Janet Hodgson, a real life incident of mysterious happenings around a little girl in the seventies. Coincidence? Yeah, probably. Anyway, to complement all those films in the box set are a selection of extras, including a booklet; on disc one there is the first of three shorts detailing the adventures of helpful dogs. Rover Makes Good is from 1952, and has a couple of kids visiting the farm in Cornwall owned by their aunt and uncle, but calamity! Twice calamity, in fact - after letting a collie off its leash and accidentally causing it to worry the sheep, both the kids and the dog are in uncle's bad books, and then, when the children ill-advisedly explore unstable mining ground, they are trapped. Can Rover the dog save the day? You will be surprised at the outcome! Only joking, it's one of the least surprising fifteen minutes placed on film. After that, there are a trio of short documentaries, beginning appropriately with Beginnings where the origins of the Foundation are related, brought in as an improving measure to stop the nation's youngsters seeing unsuitable films by replacing them with work made especially for them. In the fifties, as overseen by cinema mogul J. Arthur Rank and CFF head Mary Field, the concept of what was acceptable would be different from now, and in the following two featurettes, John Krish talks about his pieces for the organisation and the often absurd rules he was forced to abide by, and pleasingly, children from 2018 discuss their impressions of vintage CFF, from The Salvage Gang to The Boy Who Turned Yellow - it's entertaining to gauge their levels of bemusement. They'd almost certainly never heard of Barbara Woodhouse, but before she became a celebrity in her elder years for training dogs "the Woodhouse Way" during the eighties, she had been desperate to become famous through her hounds for decades. As seen in the second canine short, Juno Helps Out (1953) which featured her husband and two children acting out a domestic comedy-drama where Babs was "sick" with a "headache" and had to stay in bed, her hubby had to go to work, so the kids and the dog attended to the chores with mixed results. Juno, the family's actual pet, was a fearsome Hound of the Baskervilles-looking creature, but on the plus side could be trusted to go and buy groceries (! ), though the manner it wolfs down cake was mildly alarming. Next, the analysis, and three films were under the microscope from the adult commentators and the young observers. Kadoyng was one of the science fiction yarns from the seventies where the CFF was tending towards the bizarre to keep their audience diverted, and as one of the stars explains, the concept of a bunch of kids befriending a strange man and spending most of their time with him is not something that would fly now. Then Harley Cokeliss described his most popular feature The Glitterball and his solutions to low budget problems, and teacher-turned-author Bernard Ashley related how the last CFF project Terry on the Fence was created, not going into too much detail on the whys and wherefores of its status as the Foundation's last gasp. On the third disc, another pooch-based entertainment, this one To the Rescue produced and scripted by the rather wonderful Richard Massingham. Who was he? He was a medical man whose hobby was making short public information films, often starring himself as a slow on the uptake everyman character who got the message by the end of the five minutes' lesson. What he was trying here was to branch out into children's entertainments, and this, barely above amateur status but with real pluck and pace, was one of those, a tale of a pilfered poodle - his cohort Jacques Brunius played the villain, a French actor who dabbled in writing and directing. The result was an extended chase with Massingham as an unlikely action star, and quite charming. Finally on this set, three more documentaries; first, an examination of The Man from Nowhere, one of the spookier CFF films that had the desired effect on, and the approval of, the millennials, something that must have cheered its now-elderly author John Tully, who was awarded a quarter hour of reminiscences, ranging from his CFF work to his early career to material on perennial favourite The Double Deckers. Also here was a breakdown of how the Foundation ended its days, rather forlornly producing for television before it all ended, and how its huge archive of around four hundred films of varying durations is being preserved. That this all concludes with the news that children in 2018 are rediscovering these films, which you don't imagine applies across the board, is encouraging when the impression you're often left with is that youngsters have no interest in older movies. That the BFI keeps these works alive is wholly valuable.